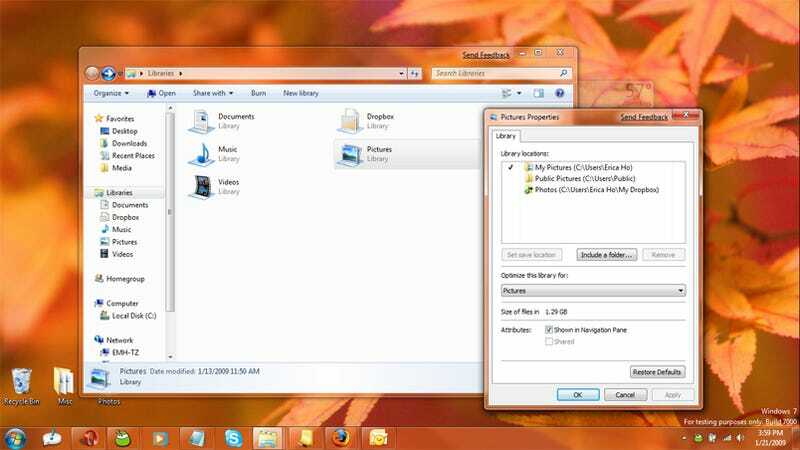 In Windows 7, Microsoft has scrapped the virtual/smart folders feature previously available in Vista to categorize documents and replaced it with Libraries. At first, I was really confused: what the hell is a library? Smart folders in Vista were essentially saved searches, and libraries do away with all of that. Unlike the "My Pictures" or "My Music" folders that exist, libraries aren't actually folders. Libraries are instead collections of supervised/monitored folders. To edit which folders the libraries monitor, all you have to do is right-click the library and go to the Properties tab. So instead of having to keep all your music in one folder, you can keep them in multiple folders scattered throughout your hard drive. In addition to changing the folders that the libraries monitor, you can actually add new ones and define what folders you want to monitor too. Simply right-click Libraries in the tree view of Windows Explorer and there should be an option to create a new library. A nice thing about the media libraries is that they are linked to Windows Media Center. Instead of having to repopulate or set up your multimedia library again, whatever changes you make to libraries will be reflected in Windows Media Center. Unfortunately, it doesn't really matter what file you throw in to what library-if you throw in a folder that contains pictures to the Music library, it will not display audio files exclusively (except in Windows Media Center). Your pictures will still show up in the Music library. It's not as "smart" as the "smart folders" in Windows Vista, which only included files that met certain conditions. It's the only change I would make, but libraries are still a vast improvement over the useless virtual folder system. Libraries are a great way to keep your files organized without actually having to be organized, if used correctly.